Marshall “Major” Taylor, also known as the “Worcester Whirlwind” was a champion bicyclist who broke world records and competed around the globe at the turn of the century. He was also a black man. He started racing professionally at age 18 and in a single year, by 1900, he held several major world records and had competed in events around the globe. Intense racism, however, was always an uphill battle for Taylor, who retired at age 32. Now, a giant banner will show him, steely-faced on two wheels, on the side of the Casey Storage Solutions on McKeon Road, visible to motorists on Interstate 290. As the Worcester Telegram reports, the 23-foot image sites alongside basketball player Bob Cousy, an astronaut suit designed by the David Clark Co. and a distinctive neon sign that depicts Coney Island Hot Dogs. News of the $100,000 banner project comes just ahead of the Gran Fono New England KMC Cross-Fest bicycle race, which benefits the Major Taylor Association. The Gran Fono race offers both challenge and enjoyment for riders of all skill level. The four different routes will each weave through the breath-taking autumn landscapes of New England. 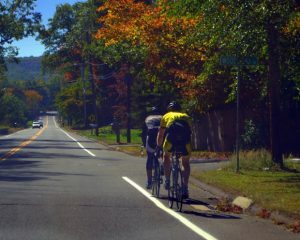 Passing through small towns, farms and stunning fall foliage, riders will have the opportunity to ride through Massachusetts, Connecticut and Rhode Island, with portions covered by hard-packed gravel and others fully-paved. There will be competitions on each route, but competition is optional. Riders along the way will have access to well-marked routes available for GPX file download. Additionally, rest stops at local establishments will be fully-stocked and options will be available for transportation to the finish line of any items purchased en route. Entry fee includes a t-shirt, a souvenir beer glass and a post-ride meal at the Thompson Speedway and a seat at the New England Builders’ Ball. The Major Taylor Association Inc. will receive a portion of the money raised. Our Boston bicycle attorneys know the mission of the organization is to maintain a statute of the cycling great in his hometown of Worcester, Mass., as well as to educate people about Taylor’s life. He entered his first bicycle race competition in his teens. By 1898, he had seven world records and a year later was an international champion – making him only the second black athlete to hold the title of world champion (Boxer George Dixon was the first). He raced in Europe, Australia and all over North America. However, racism tempered his successes. Other cyclists and fans often jeered him. Crowds through things at him. He was bumped. He was hassled. He was forbidden from riding in the American South. Once in Boston, a fellow biker pushed him off his bike and choked him until police arrived. He retired at age 32, his bicycle racing successes largely unrecognized. Contributions to races like the Gran Fondo – and efforts like the warehouse banner project – help to honor his memory and accomplishments.